Bound by a gold tasseled cord, this program elegantly describes your wedding day in fairy tale fashion. Printed on heavy textured cardstock with accents of handmade Italian foil paper, the storybook programs by Janet Maples of Izzy Girl are an excellent way to whisk guests away into your love story. $8.75/100 programs, from Green Lake–based Izzy Girl. 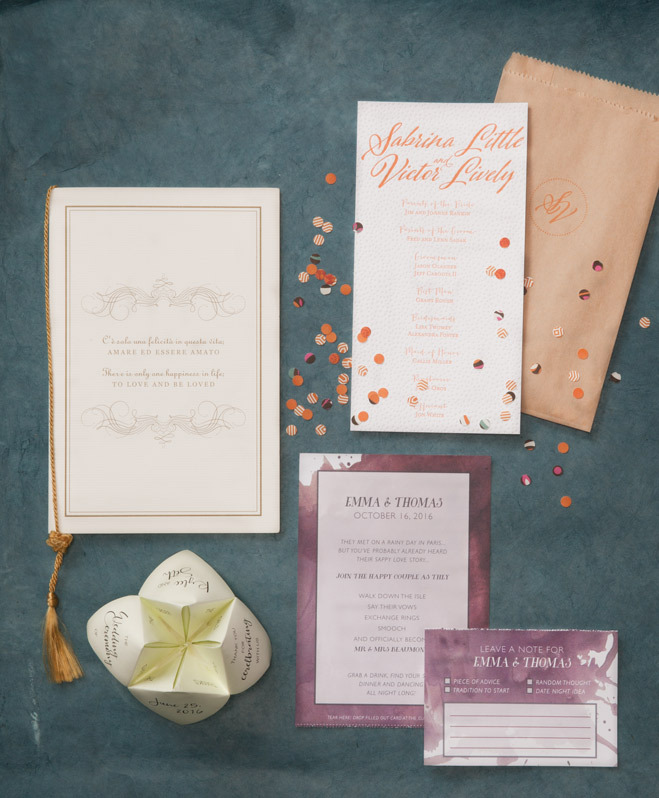 Putting a spin on an old tradition, Inkfancy’s beautiful one-page program comes hot off the printing press in a sweet paper bag stamped with a custom monogram and filled with colorful paper confetti. Colors are completely customizable, and guests of all ages will truly enjoy showering you and your sweetheart as you take your grand exit. Price upon request, from Tere Mendez of Fremont-based Inkfancy. Printed on 100 percent recycled, eco-friendly paper, Letter and Line Studio’s modern watercolor-inspired programs have something for both guests and the newlyweds to take away. Designed by Sarah Frost, the perforated cards at the base of the digitally printed programs allow ceremony attendees to leave the couple notes of well wishes, date night ideas and advice. $2/program, from Edmonds-based Letter and Line Studio. Add an element of whimsy to your ceremony with Paper Fling’s unique fortune teller programs. Guests will love playing with this digitally printed 3-D program designed by Ruth Song, discovering more about your special day under each paper fold. $300/100 unfolded programs or $600/100 prefolded programs, from Kirkland-based Paper Fling.